About every other Friday, the children in King Hall at St. Joseph’s Home for Children await special visitors. For the last nine years, Lisa Bugman has been bringing her therapy pets to the Catholic Charities’ site. Golden Retrievers Ella, Piper and Ivy have become trusted friends to the children there. “Ella, Piper and Ivy usually bring a calming effect to the kids here,” said Joan Ahrendt, a principal youth counselor in King Hall. Children in King Hall range from six to 12-years-old. Sometimes, kids will cuddle up with one of the dogs while they practice reading out loud. Ella, Piper and Ivy are great listeners. On a recent beautiful spring day, Ivy played fetch with the children outside. The dogs are great playmates. Children often come through our doors because of trauma they experienced in their home. The safe environment provided by St. Joe’s is key to helping them overcome emotional barriers. Many children at St. Joseph’s Home for Children have not learned the proper way to treat a dog. 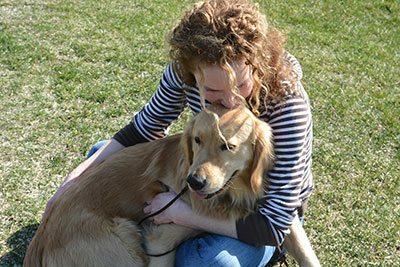 The therapy pets show them to be gentle and how to interact and play with dogs. While puppy love can’t solve all of their problems, the simple act of petting a dog who loves unconditionally can go a long way.